The current version of Color It! (version 4.5) will NOT run under Mac OS X 10.7 (Lion) or later. Apple has chosen to drop support for all applications with PowerPC code. Previously, their Rosetta translation software permitted programs like Color It! 4.5 to run beautifully, but it is no longer supported in Mac OS X 10.7 or later. We are working hard on a new version of Color It! that is being built from scratch that WILL run in 10.7 and later, and also takes the fullest advantage of things like running native on Intel processors and accessing the full range of the system’s Services. The new version will run faster and permit working with much larger images, and will be able to utilize the Core Image visual effects that are built into the operating system. While this will expand the program’s capabilities, it’s a massive undertaking that will most likely take months yet.The new version will be an improved program with modern capabilities that’s also easier to update, while still retaining our legendary ease of use. Until the new version is out, you’ll need to either not upgrade to OS X 10.7 or later, or set up a dual-boot situation where you can still start up your Mac in OS X 10.6 or before to run Color It! version 4.5. The folks over at Mac OS X Daily have a handy step-by-step article on how to do so here. A: If you try to run Color It! 4.5 from the CD-ROM or a disk image (.dmg) file, you will get this error. Your Registration information needs to be stored in the program, and new data cannot be written to a CD-ROM or disk image. Simply drag the Color It! 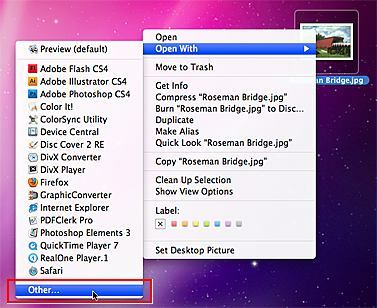 4.5 program icon to your hard drive, and launch it from there. Q: Does Color It! 4.5 work with Mac OS X 10.6 (Snow Leopard) and 10.5 (Leopard)? If you did not install Rosetta when installing 10.6 (it is no longer installed automatically), the first time you launch Color It! 4.5 (or any application that requires it) under 10.6 a dialog will appear asking if you wish to install Rosetta. Answer yes and Rosetta will be installed and Color It! 4.5 will run as usual. A few users have reported Color It! unexpectedly quitting after updating to Mac OS X 10.5. As Apple advises, “Permissions problems sometimes happen after you update your system or install new software.” If you experience this, run Repair Disk Permissions. This functions in many ways like Rebuild Desktop did under Mac OS 9 and before, and can correct a number of mysterious problems on your Mac. In the Finder under the Go menu, choose the Utilities folder. In the window that opens, locate and launch the Disk Utility program (see below). Click on the name of your hard drive in the column to the left. To the right, click on the “First Aid” tab if it is not highlighted. Click on the Repair Disk Permissions button below and let it run. This may take some time depending on when permissions were last repaired. When it is finished, you will see “Permissions repair complete” at the bottom of the text area above the button. Quit Disk Utility and launch Color It! again. Running “Repair Disk Permissions” in Apple’s Disk Utility program can correct a number of mysterious problems with your Mac. Q: In Mac OS X 10.6 (Snow Leopard) double-clicking Color It! documents launches a program other than Color It! 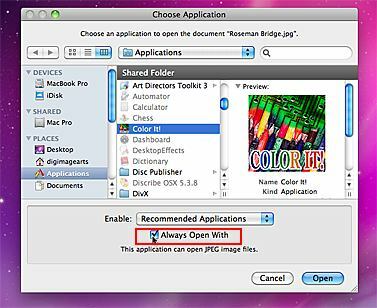 A: In Mac OS X 10.6, Apple changed the method the system uses to link documents to the applications that created them, so the expected application may not be launched when a document is double-clicked (this affects ALL applications, not just Color It!). The process to re-link documents with their applications is simple. In the “Choose Application” window that opens, locate the copy of the Color it! program on your hard disk (typically, it is located in the Applications folder (if so, type COMMAND-SHIFT-A to go directly there). Select the Color It! program from the list. At the bottom of the window, be sure to check the “Always Open With” box. Then click the Open button. Q: Color It! 4.5’s “Live” preview for filters does not seem to work with Mac OS X 10.6 & 10.5. A: Apple has made some low-level changes in the latest versions of the Mac operating system that interferes with the live preview functionality that makes the program appear to hang whenever one of the “live” boxes is checked. To exit the filter dialog box after clicking Live Preview, type the COMMAND-. [period] keyboard shortcut. To change filters back so Live Preview is not checked, make sure Color It! is not running. In the Finder, hold down the Control key and click on the icon for the Color It! program. A pop-up menu appears. Choose the “Show Package Contents” command. A window opens. Double-click on the “Contents” folder to open it. The Contents window opens. Double-click on the “MacOSClassic” folder to open it. The MacOSClassic window opens. Double-click on the “Color It! Stuff” folder to open it. Take the file named Color It! 4.5 Prefs and throw it in the Trash. Empty the Trash. Close the Color It! Stuff window. Double-click on the Color It! program icon to start the program again. When the program starts and does not find a Prefs file, it will create a new Prefs file with default settings, and the "Live" buttons will no longer be checked. Please be aware that Apple no longer supports Classic mode AT ALL under Mac OS X 10.5 (Leopard) or above. Upgrade to Color It! 4.5 to run under Mac OS X 10.5 or 10.6 (click here to purchase and download). Q: When using Color It! 4.0 (or previous versions) in Classic mode under Mac OS X, sometimes text entered does not appear. The cursor moves as letters are being typed, but no text shows. A: Problems with ‘invisible’ text are caused by third-party extensions installed in your copy of OS 9.x that launches when the Classic mode starts up under OS X. A great number of third-party add-in extensions (those not made by Apple) will not work in Classic, and in some cases will prevent Classic mode from launching or even go so far as to cause it to crash during its start-up process! Go to System Preferences->Classic and click on the Advanced tab, and from the pop-up choose "Turn Off Extensions.” This turns off all non-Apple third party control panels and extensions. Or (if your particular Mac allows it) you can re-boot in the System 9 used for Classic mode, choose Apple Menu->Control Panels->Extension Manager, and from the pop-up menu, choose “Mac OS 9.x All.” Then re-boot back in OS X once again. Please be aware that Apple no longer supports Classic mode AT ALL under Mac OS X 10.5 (Leopard) or above. Q: Will a Mac OS X-native version of Enhance be produced? A: We are in the process of evaluating Enhance to see if there is sufficient interest to produce a Mac OS X-native version. Q: What are the differences between Color It! and Enhance? A: The major differences are that Color It! is Mac OS X-native; Enhance is still for Mac OS 9/Classic. Enhance has layers capability, while Color It! does not. Color It! has linear and radial gradients; Enhance has linear gradients only. Color It! lets you create and edit animated GIF images. Color It! has the option to save clipping paths when saving in the PostScript file format and save alpha channels in the PICT file format. Enhance has a Layers palette and Layer Mover tool, and can open layered Photoshop format files with the layers intact. Enhance also has a Ruler and Angle tool, a Replace Color filter, supports drag-and-drop, and permits viewing a Converted RGB color view for CMYK images. Enhance has a Preview in Web Browser and Save HTML Tag to Clipboard commands, displays download time estimates in the Get Info window; and has color selectors in the Extrude & Dropshadow dialog boxes. Q: When using Enhance 4.0 (or previous versions) in Classic mode under Mac OS X, sometimes text entered does not appear. The cursor moves as letters are being typed, but no text shows. Q: Does Digital Darkroom for Windows work under the Vista or Windows 7 operating systems? Q: (WINDOWS ONLY) When I save an image in JPEG format the quality seems to be low regardless of the quality setting I choose. A: The JPEG plug-in in an older version of Digital Darkroom did not properly apply the Quality setting chosen when saving an image in the JPEG file format (regardless of the Quality setting chosen, the image was always saved in Low Quality). In order to use the file “JPEG.8bi”, place it in the directory Darkroom:DDStuff:Plugins. If you are asked to confirm the replacement (“Would you like to replace the existing file ‘JPEG.8bi?’) click Yes. If the Digital Darkroom program is running, exit the program and restart it. Now when you go to save an image and choose “JPEG (*.jpg)” under “Save as type” the JPEG Options dialog will open, and the quality setting chosen will be properly used. The correct JPEG plug-in may be downloaded here. Have a Technical Support question? Click here.